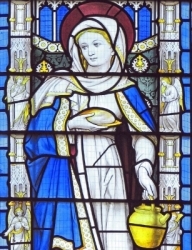 Sister of Saint Lazarus and Saint Mary of Bethany. Friend of Jesus, and hostess to him in her house. May have been part of an early mission to France. Studied at Rheims, France. Monk and prior at Cluny. Assistant to Pope Saint Gregory VII, and helped in his reforms. Bishop of Ostia, Italy. Cardinal. Papal legate to Germany. As pope, he continued the reforms in the face of opposition by Holy Roman Emperor Henry IV and his anti-pope Clement III (Guibert of Ravenna); he was unable to move to Rome until 1093 when Clement was removed. Urban concentrated his efforts in places that recognized him, such as southern Italy, Tuscany. and the Lombard cities. Urban summoned councils of whole populations to advertise and gain popularity for the reforms. There were councils at Piacenza, Italy in 1095, Clermont, France in 1095, Rome in 1097 and 1099, and Bari, Italy in 1098. At Clermont, Urban preached a sermon that started the First Crusade. Urban condemned King Philip I of France over Philip's repudiation of his wife. Without Urban's work, most of the reforms instituted by Pope Saint Gregory VII would have been vanished. Joined the Salesians in 1890. Ordained in 1895. Secretary to Blessed Felipe Rinaldi for ten years. Director of the College of La Esmeralda in Sarria, Spain. Leader of the Salesians in Camaguey, Cuba in 1916. Salesian Provincial for Bolivia and Peru. Salesian Provincial in Barcelona and Valencia, Spain in 1925. Known not just for his administrative skills, but as a mentor and spiritual director for his brother Salesians. In the persecutions the Spanish Civil War, he was arrested while conducting a retreat in Valencia; the others there were imprisoned, but because he was a priest, Father José was sent out for immediate execution. Martyr. Born to a peasant family. Priest. Canon of the cathedral of Tours, France. 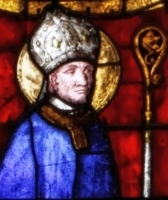 Bishop of San-Brieuc, Brittany, France in 1220; he served for 14 years. Known for his simplicity, charity, and his fight to defend the faithful and the rights of the Church against civil authority; it led to him being exiled, imprisoned and tortured before finally returning to his diocese in 1230. Worked to construct the cathedral. Had the ability to heal by prayer. 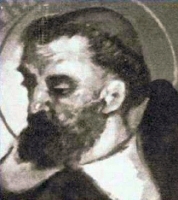 Relative of Saint Louis Bertrán. Joined the Dominicans at the convent of Santa Catalina in Barcelona, Spain in 1611. Priest. Missionary to the Philippines in 1618. Missionary to Japan in 1623; he worked the rest of his life in the Omura region. He brought many to the faith, especially working with Dominican tertiaries. During a period of persecution he hid from authorities in a leper colony, but was found and executed with Blessed Mancio de la Cruz, Blessed Pedro de Santa Maria and three of the patients who had given them shelter. Martyr. When Seraphia was very young, her family fled from Syria to Italy to escape the persecutions of Hadrian. Orphaned as a young woman, she had many offers of marriage, but was drawn to a religious life; she sold all her possessions, gave the money to the poor, and then sold herself into slavery. By her good example, she converted her owner, Saint Sabina. Martyr. Married layman servant in the apostolic vicariate of Guizhou, China. Convert. Martyr. One of the Martyrs of China. At age 13 Petrus began studying to be a catechists; Blessed Luis Bertrán was his teacher. He supported the work of the missionaries, spending his wages to buy them supplies, strengthening the faith of new Christians. During a period of persecution, he hid from authorities in a leper colony, but was found and imprisoned in Kuwara, Japan. While in prison he was admitted to the Dominicans as cooperator brother. Martyr. Joined the Hospitallers of Saint John of God at age 30. Worked at an asylum hospital. Seized as he was leaving the hospital, he was ordered to blaspheme to prove that he renounced Christianity; he refused. Martyred in the Spanish Civil War. Married lay woman in the apostolic vicariate of Guizhou, China. Widow. Carried letters from Blessed Joseph Tshang and Blessed John Baptist Lo to their bishop. Arrested for helping spread Christianity. Martyr. Born to a wealthy family. A pious child, at age seven she moved into a convent of Béguines. She later joined the Cistercian nuns at Valfleury, France. Known for severe austerities, punishing her body almost to the point of torture. Received a vision of Jesus. Founded the convent called Our Lady of Nazareth near Lier, Belgium, and served as its first prioress. Eudist priest. Imprisoned on a ship in the harbor of Rochefort, France and left to die during the anti-Catholic persecutions of the French Revolution. One of the Martyrs of the Hulks of Rochefort. Worked with Blessed Luis Bertran, often acting as a guide for the missionaries. During a period of persecution, he hid from authorities in a leper colony, but was found and imprisoned in Kuwara, Japan. While in prison he was admitted to the Dominicans as cooperator brother during the last Mass celebrated by Blessed Luis. Martyr. Sister of Saint Faustinus of Rome and Saint Simplicius of Rome. Betrothed to be married even though she had taken personal vows of chastity. When she was caught burying her martyred brothers, she was denounced as a Christian by her fiance Lucretius, which led to imprisonment and execution. Martyr. Seminarian in the apostolic vicariate of Guizhou, China. Locked in a cold, damp cave, tortured and martyred for his faith. Married the sister of Saint Hilary for seven years at which point they separated so that Lupus could become a monk at Lérins Abbey. Bishop of Troyes, France in 426. Travelled with Saint Germanus of Auxerre to fight Pelagianism in Britain. Saved Troyes from the attack of Attila the Hun in 453. Seminarian at Su-tchuen, China. Martyr. Spiritual student of Saint Felix of Martano near Spoleto, Italy, and was there at Felix's martyrdom. Faustinus was abused for his faith, but allowed to live. King of Sweden. Convert, brought to the faith by Saint Anscharius. During a time of famine, he was sacrificed to the old pagan gods because he would not offer such sacrifices himself as priest-king. Fourth-century Christian soldier in the imperial Roman army during the reign of Julian the Apostate. Assisted persecuted and imprisoned Christians, and ministered to the sick and poor. Chosen bishop of Orléans, France in 453. Formally received Saint Genevieve of Paris when she passed through Orléans. Brother of Saint Beatrice of Rome. Martyred in the persecutions of Diocletian. Founded the monastery of Luxulyan in Cornwall, England, and served as its first abbot. Monk. Abbot of monastery on the island of Inishcaltra. Wrote a biography of Saint Brigid. One of 23 Christians martyred in the persecutions of Gallienus. One of 23 Christians martyred as a group in the persecutions of Gallienus. 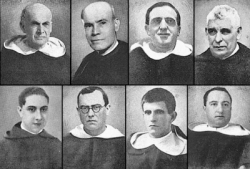 A group of Dominican priests and friars who were martyred over the course of a day in the same town by the same group of anti-Christian forces in the Spanish Civil War. Carmelites of the Ancient Observance novices, friars and priests who were all martyred together in the Spanish Civil War.